David's Bagels | The best bagel store in New York. A New York Staple for over 30 Years! Since our inception, our goal was always to provide customers with unsurpassed quality. As eating habits have changed over the past few years, society has become more health conscious. With this new transition, we knew we needed to service our clientele in a new manner. The solution was to provide the same "comfort foods" we have all enjoyed at David's, but in combination with healthy choices. This new vision has rejuvenated a new passion for providing more than just bagels. The David's brand can be found throughout the New York Metro area. 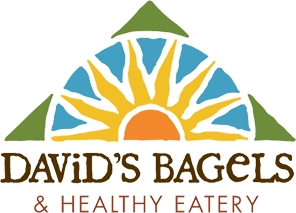 And we hope that someday soon, you will see David's bagels far and wide! We always welcome your questions and comments, and we can't wait to see you!